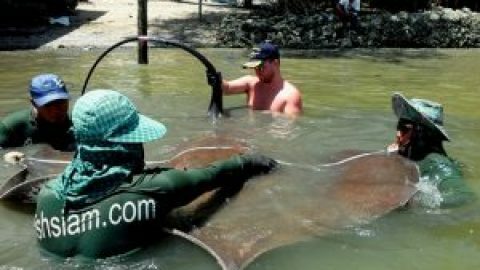 Globe trotting Fly fishing enthusiast Eric from the UK began his Thailand fly fishing holiday with a visit to Pilot 111 fishing ponds near Bangkok fishing for Giant Snakehead. On arrival at the fly fishing ponds Eric equipped with a wide selection of his own rods began fishing at one of the Giant Snakehead ponds. Snakehead were observed to be avidly feeding when he arrived so these were the first port of call. The fish were chasing baitfish in the margins and a couple of casts with a lead eyed black clouser resulted in a Giant Snakehead of about 2lb. The disturbance dispersed the fish and they became very difficult to tempt after that. Luckily with the vast array of species on offer at the venue the next choice was but yards away. The next pond along held Pacu which were happily feeding on the array of vegetable matter which had been put into the water to keep them from getting hungry. Changing flies to small light green patterns saw him finding something the fish wanted to eat and quickly a few fish upto 3lb were taken. The next pond gave some exciting Barramundi fishing with a number of these aerobatic fish eating a wide variety of clousers showing no real preference to any particular colour. With the Pacu and Barramundi ticked off the list featherback were next. These fish could be seen in the middle of their pond and the use of a dark epoxy headed fly which was allowed to sink amongst them and then slowly retrieved met with many bites and some good fun. The lunch in the bankside restaurant was excellent and luckily coincided with a downpour. 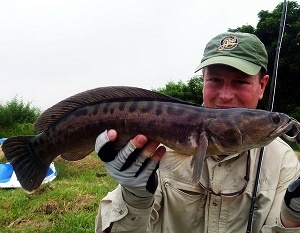 After lunch the time was spent trying to catch a larger Snakehead than he had caught in the morning. The wily nature of this fish ensured with took a considerable time. Eventually after numerous fly patterns were tried and different areas fished a tremendous 5lb fish graced the bank. The Asian Redtail catfish steadfastly refused to eat anything so with the day coming to a close a return to the Barramundi pond was made. This time the fishing was exclusively with poppers and some explosive aerial action followed as the fish chased the lures like they hadn’t eaten in a month. Most casts quickly had a fish attached and by the end of the day at least 15 Barramundi had been taken in little over an hour.